Super Sipperz Reviews: Does it Work? • Positive feedback from those who have used it. • Doesn't work well with soda. • Unclear if dishwasher can effectively clean inside straws. • 160 small parts, which could be easily lost or misplaced. Super Sipperz is a fun and creative toy for kids. And, while the product idea is not original, we feel it has plenty of re-play value. 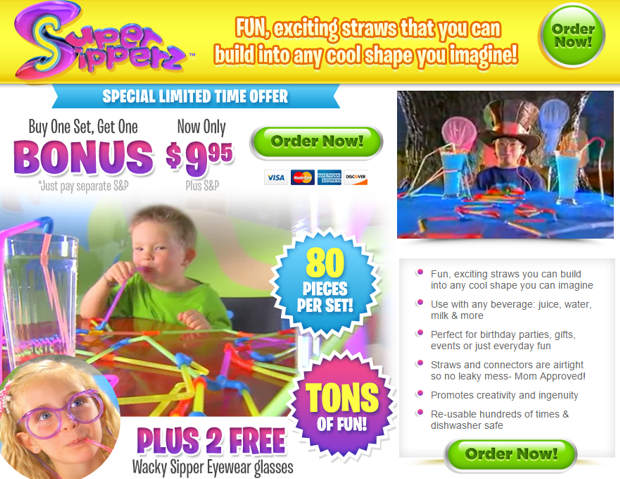 Super Sipperz can be described as a craft set, which allows kids to build a creation in the manner of Tinker Toys, but in the form of straws which can be used to drink any liquid. When ordering online, an 80-piece Super Sipperz set costs $9.95 plus $4.95 shipping. There is a required second “free” set for another $4.95, and an unexplained $2 “web surcharge fee” which brings your total order to $21.85. A pair of Wacky Sipper Eyewear is also included. Purchasing from the website also gives you a free magazine subscription, which does not automatically renew. Alaska and Hawaii customers must pay an additional $10 surcharge. Super Sipperz became available in stores such as Toys R Us and Kmart in late 2015 for a price of about $10. The TV commercial below aired throughout much of 2015. Although Super Sipperz is likely to suffer from the reputation of being a knockoff product (see below), it is still best to judge it on its merits. In our evaluation of the product, we feel that it generally works as expected, and it is constructed of average quality. The straws and elbows seemed to fit together well and we did not experience any significant leakage. Keep in mind that every child and every creation will be different, so your mileage may vary. Some creations will be better suited to delivering beverages than others, so keep that in mind if your first attempt does not go well. We noted a few other considerations. Although the product is dishwasher safe, it isn’t clear how well a dishwasher can reach the small areas inside these straws. We would prefer to rinse or soak them in addition to placing them in a dishwasher. Depending on the length of your creation, soda does not seem to work well – often arriving in the form of foam. You may want to be mindful of all of the small parts, which numbers 160 in this set. It would be easy to lose some of these small parts. Leakage is still possible if the child does not insert the straws properly, so you may want to supervise closely, especially if they plan to drink juice in an area where stains would be a concern. At first glance at the television commercial above, we were immediately reminded of a similar product called Strawz (even with the “z” spelling at the end!). That product has been available for several years, and costs about $18. It is highly rated on Amazon. There is another product which advertised earlier in 2015 which looks virtually identical to Super Sipperz, which is called Zippy Straws. In fact, they are so similar that we aren’t sure if Super Sipperz is simply a re-branding of that product, or just an outright knockoff. Super Sipperz is a fun and creative toy for kids. And, while the product idea is not original, we feel it has a plenty of re-play value. Because Super Sipperz is now available in stores, you may want to purchase locally in order to avoid shipping delays and costs. If you’ve used Super Sipperz, please give it a star rating and comment below. This review has been updated since its original publication in May 2015.